I added the 4th video to my new YouTube Channel! 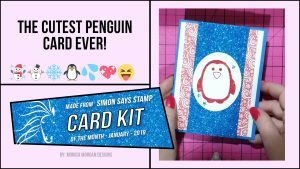 It’s a cute little design featuring Simon Says Card Kit for January 2019. I used quite a lot of emojis and fun video transitions and effects perhaps maybe a little bit too much! I hope you enjoy watching it and if you can please give me a thumbs up and subscribe to my channel so that I can keep bringing you more of them thanks so much for visiting my blog and leave a comment if you want! Bye for now.